A medieval cathedral that's stood the test of time was devastated by a massive fire in just one day. 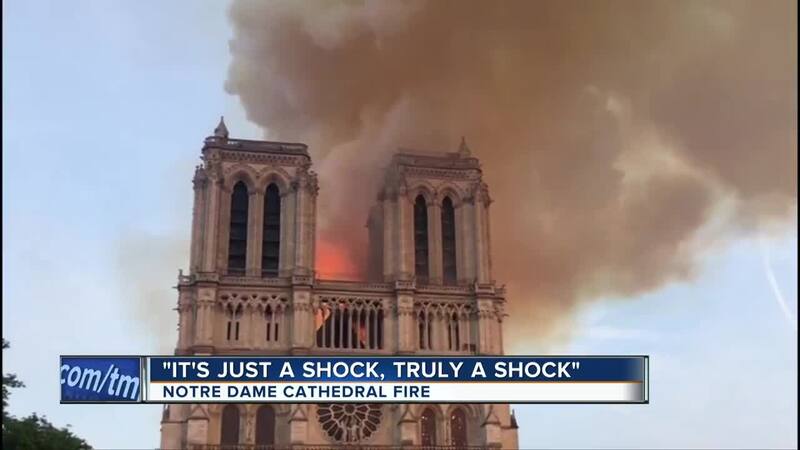 The Notre Dame Cathedral, one of the world's most visited landmarks, went up in flames Monday afternoon in Paris, France. For many vacationers, the nearly 900-year-old church is a must-see. "It's just a shock, truly a shock," Jane Yarnall said. "It's something I had always dreamed of seeing. I've never been to Paris before." Yarnall, who lives just south of Kenosha, went to the Notre Dame Cathedral on Monday, but she and her family never made it inside due to the massive crowds. "We were there all afternoon, it was very crowded, very crowded," Yarnall said. Now, Yarnall is thankful that was the case. Less than an hour later, flames ripped through the structure. "If we had decided to stay, could you imagine if we had gone inside and gone all the way up the stairs and up to the towers or whatever? We would have been in serious trouble," Yarnall said. UW-Milwaukee junior Lena Jensen was in a Paris classroom when cathedral's roof came tumbling down. "It's absolutely beautiful so it is a heartbreaking thing," she said. Jensen is studying abroad to learn about French culture and politics. On Monday, she watched as the nation was overcome by sadness. "For all French people, it's such a big effect because it is such a historical monument, pretty much the oldest in Paris itself," Jensen said. While the damage looks severe, Yarnall is holding onto hope that the building may be restored so she can finally make it inside. French President Emmanuel Macron has vowed to rebuild the 12th century masterpiece. "My hope is that they can save as many of the paintings, the glass, all the beautiful, beautiful historic things in there," Yarnall said.